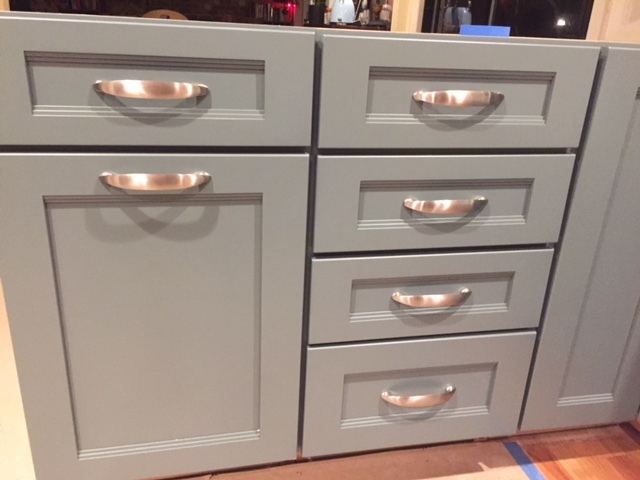 Rosy the Reviewer: My New Kitchen, or, How I Survived a Kitchen Remodel But Told My Kids If I Ever Decided to Do Something Like That Again They Had My Permission To Put Me in a Home! 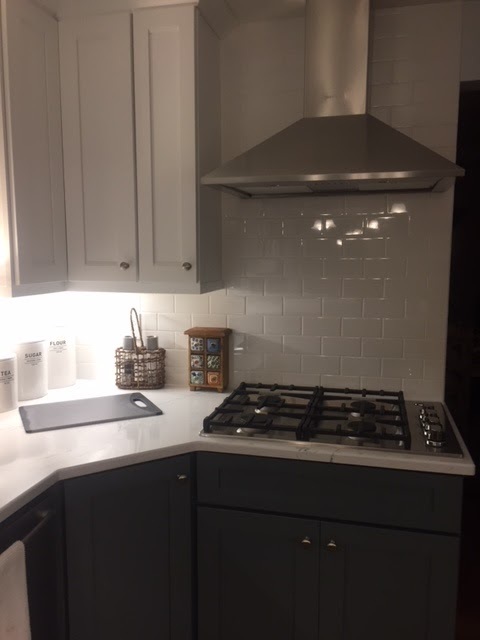 My New Kitchen, or, How I Survived a Kitchen Remodel But Told My Kids If I Ever Decided to Do Something Like That Again They Had My Permission To Put Me in a Home! No that's not my new kitchen. That's my old kitchen. Before I get into the new kitchen, let me give you a little background on what started this whole thing. A few months ago, when I was visiting my son and feeling a bit down, I said to him, "My life hasn't turned out the way I had hoped it would." Now, I know, we aren't supposed to share that kind of thing with our kids, and frankly, I know that the happiness of their parents is not in the forefront of our kids' minds, but I said it anyway. I went on to explain that I thought I would be living near my adult children and enjoying the grandchildren, when instead we were strewn all over the U.S. I was actually kind of fishing to see if my son said something about how much he wished I would move closer. He didn't. I had been thinking that perhaps Hubby and I should move back to California to be nearer to the grandkids. But when he didn't bite, I fished some more and said, "How would you feel if I moved to Virginia to be nearer your sister?" He didn't seem to care. So that's when I realized Hubby was right. Moving would be a huge hassle especially if the kids didn't care one way or another. Then my son decided he would solve my problem. "Why don't you move into town, Mom? You could walk to the Starbucks and meet all kinds of people." Now I am not certain that being able to walk to Starbucks is going to insure I will meet people, but I know where he was coming from. He wanted me to be happy. Your kids don't want to have to worry about you so he was trying to help so that he didn't have to worry about me. Though walking to Starbucks is important to me, I don't think it's going to necessarily make me feel better about my life, but he did spark my imagination. We currently live in a suburban area and, though it's very pretty, and we have a nice piece of land, I can't walk anywhere, so I thought, "He's right. And I do love Starbucks. So as soon as I got home, I told Hubby, "We're moving into town." I'm impulsive like that. Have you noticed? So Hubby sighed (he's used to me by now) and got the ball rolling. We qualified for a big mortgage because that's what it would take to move into town, we called a realtor and started looking at houses. Long story short, it only took one weekend of looking and not seeing anything as nice as what we had and yet costing twice as much, and it didn't help that our realtor valued our house for a tat bit lower than we had hoped, so it wasn't difficult for us to decide we had it pretty good where we were, not being able to walk to Starbucks not withstanding. This was probably not the time to make a big move. Hubby sighed a huge sigh of relief. 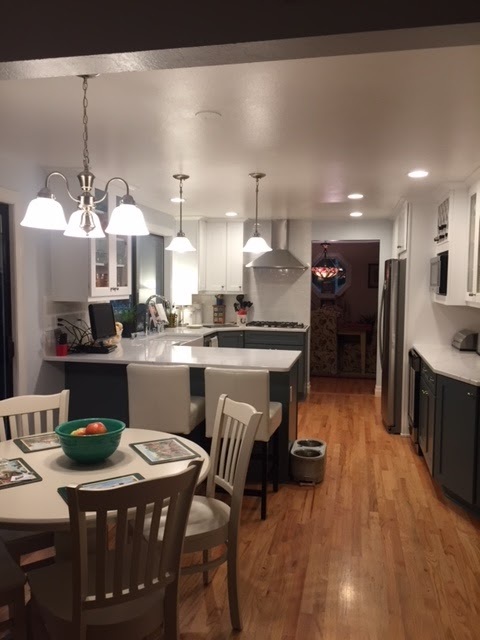 Oh, did I mention that when I was visiting my son, I got to see their new white kitchen? If we are not going to move, I want a new white kitchen! Huge intake of breath from Hubby. Did I mention that I am impulsive? And can I now add...if we only knew? The kitchen was demolished and the project manager says the electrical is going to cost double what we originally thought AND there will need to be more drywall than we originally thought AND a myriad of other things and then he asks, "Do you want to proceed?" When you no longer have a kitchen, what is the correct response? And we were already twenty grand over the original estimate. Huge intake of breath from Hubby AND me! "Yes, we want to proceed." Once it all sunk in what I had gotten us into, I started to panic and fall into a deep funk. Hence the title of this blog post. But I will try to recover myself enough to continue with the story and actually give you some tips on what we learned along the way besides the fact that we are never, ever going to do this again. 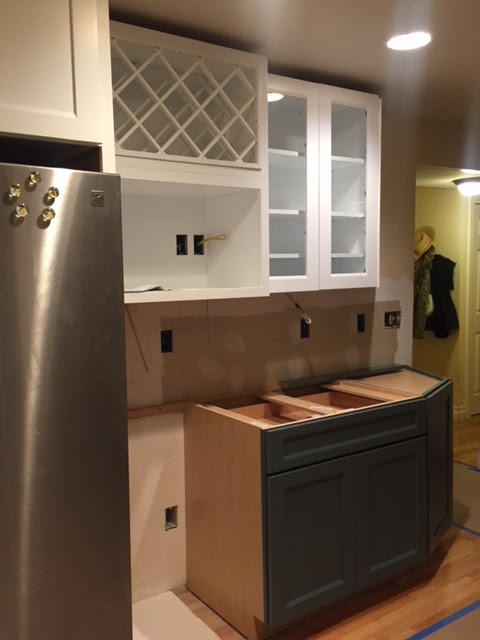 I started to feel a little better when the cabinets and sink were installed after only a couple of weeks into the project. 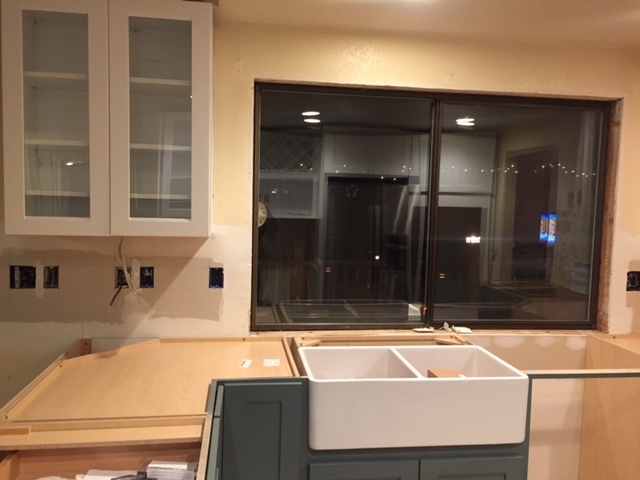 Things were moving along nicely and I was starting to really look forward to my new kitchen and having it ready for Christmas when our daughter and her husband would be coming. 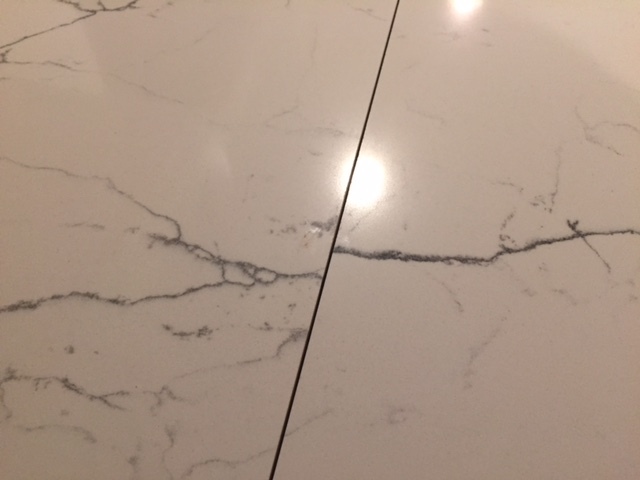 I had been concerned that the seam in the quartz for the countertop was going to be across the widest part of our counter space - the peninsula - the place where we sit and eat and spend most of our time. But we were assured that once the veins were matched up the seam would not show very much. 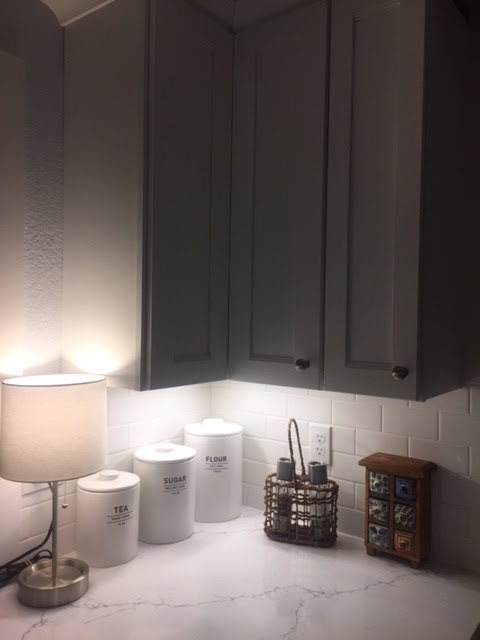 So you can imagine what we felt when the countertop was installed and Hubby noticed THIS! The work was halted, there was much discussion, many phone calls back and forth from the installers and the powers that be back at the main store, we met with everyone...and then, once it was determined that nothing could be done, we were asked THAT QUESTION again! Did we want to proceed? 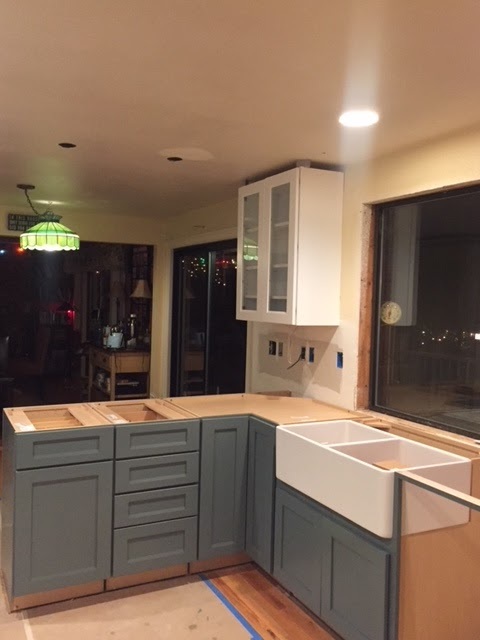 Well, except for having them remove the countertop, choosing something else and losing the money for the original quartz, I guess we had to proceed. That took a week off of our project and when the countertop was finalized, it really looked fine. Looking back...I can't help but wonder if I would have even noticed that discrepancy had Hubby not noticed it first. So I blame him! So it was back to work and everything went smoothly after that. 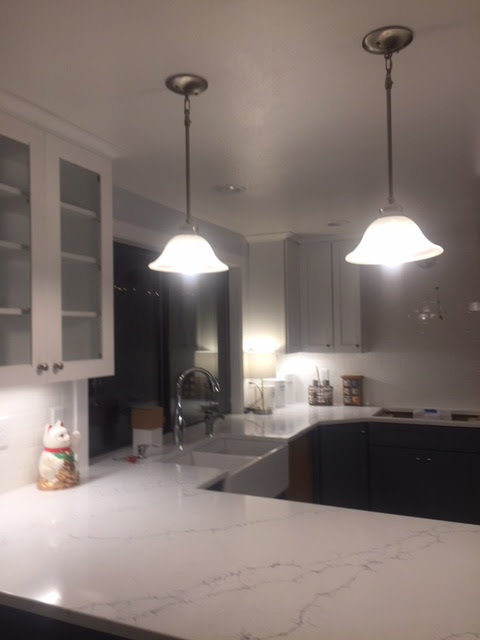 The project was not only finished on time - it was projected to take six weeks and it did, though it would have been finished in five weeks had we not had that meltdown about the veins in the countertop not matching - it was finished just in time for Christmas and I was very happy. I wanted a white kitchen, especially since we live in a forested area and the kitchen was rather dark. 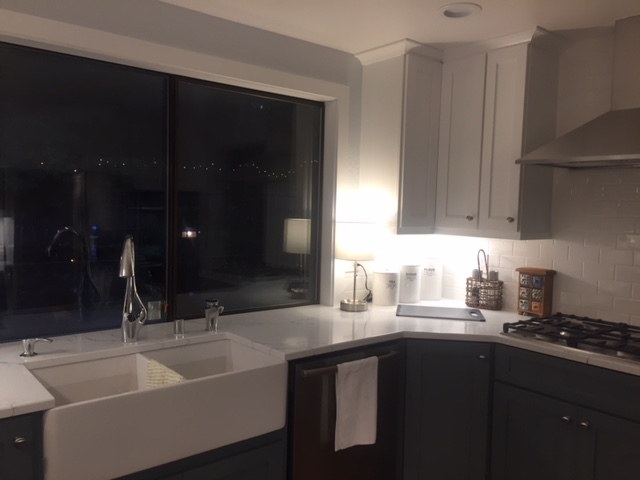 However, I had liked some kitchens I had seen where the top part of the kitchen was white and the lower portion of the kitchen was a different color, so I decided to do that. 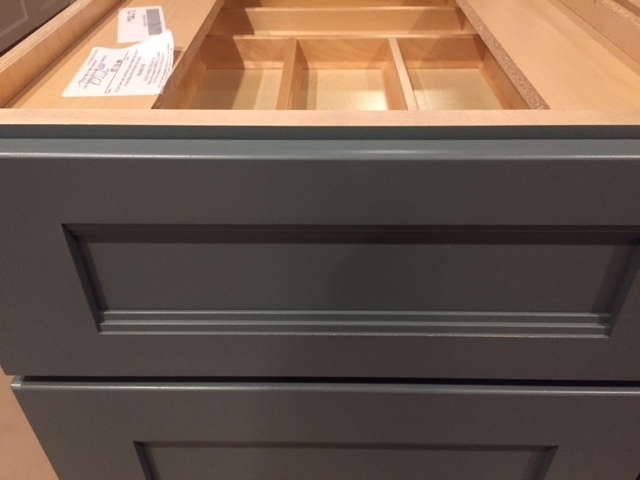 I wanted Shaker cabinets and had originally wanted to do white cabinets on top and gray on the bottom, but when we saw this sort of gray/green/blue cabinet which was Shaker-style but with a little extra detail, we liked the color and that detail. 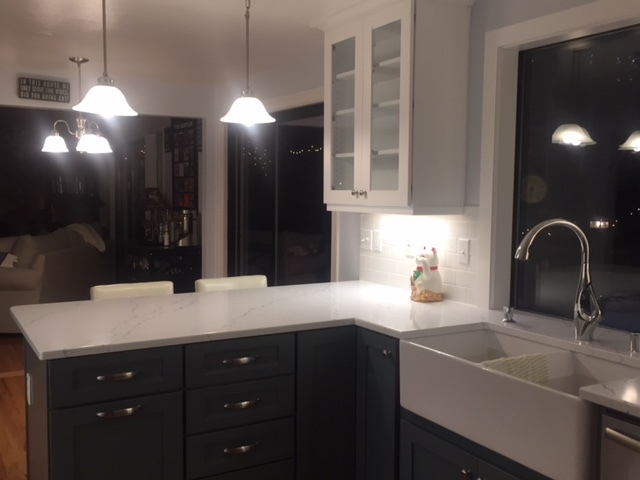 The color mitigated the coldness that can sometimes come from an all white kitchen and the little detail on the cabinets gave a boost to the Shaker style which can come off as quite plain. 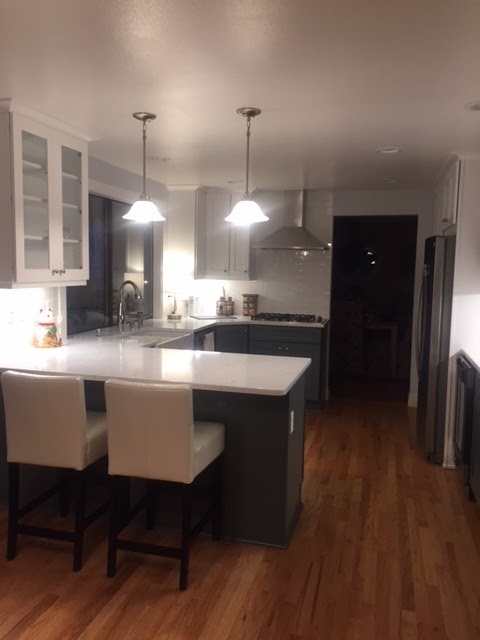 We added a farmhouse sink, chimney style hood, gas cooktop (we had an electric stove before), wine fridge (duh), double wall ovens, the aforementioned quartz countertop, subway tile back splash, under-cabinet lighting, pendant lights over the peninsula and a pantry where a little desk had been to make up for losing our original pantry when we put in the double ovens where the pantry used to be. 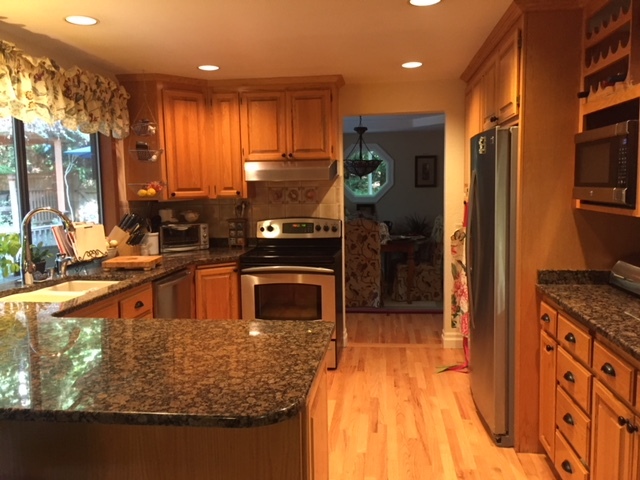 Other than moving a couple of things around and losing a bit of cabinet space, the kitchen footprint and the floors remained pretty much the same and even with that, our final cost was twice the original estimate. I always have had expensive taste. But we are happy with the outcome and enjoying our new kitchen! And that little hissy fit we had about the veins in the countertop not matching exactly? It's hardly noticeable. After it was finished, we went on a little weekend trip to California so it wasn't until we got back that it occurred to me that I had to actually put everything that was boxed up for the demolition of the kitchen BACK into the kitchen! 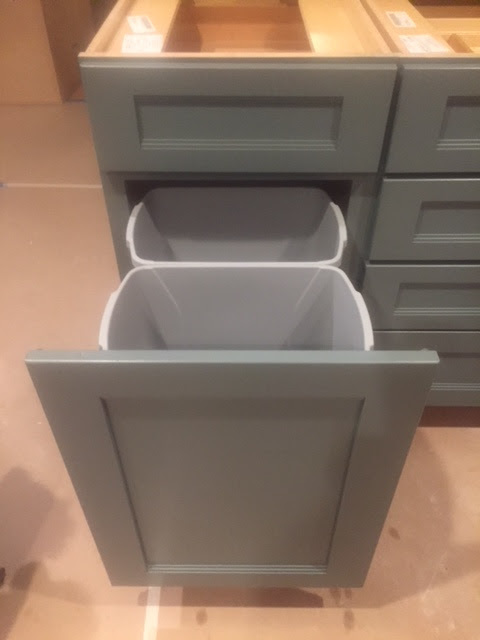 Now it's one thing to have to physically open every box and put everything away, but it's even more difficult to decide WHERE to put everything, especially if your kitchen is much different from your old one. In our case, the footprint of the kitchen was pretty much the same but the addition of two wall ovens, the cabinet for the garbage and compost, the wine fridge and the chimney hood over the cooktop all decidedly ate into the cabinet space I once had so I had to spend quite a bit of time deciding where everything was now going to go in my new kitchen. It's also sobering to go through everything as you put it back and wonder, "What the hell? Why did I have five different kinds of salt and three huge bottles of balsamic vinegar? And what is this can of baked beans with a Best Buy date of June 3, 2012?" But one whole exhausting day later, it was all done and I am very, very happy. We celebrated when we finally had our first cooked meal from our new kitchen. So what did this ordeal, er, I mean remodel teach me that I didn't already know? 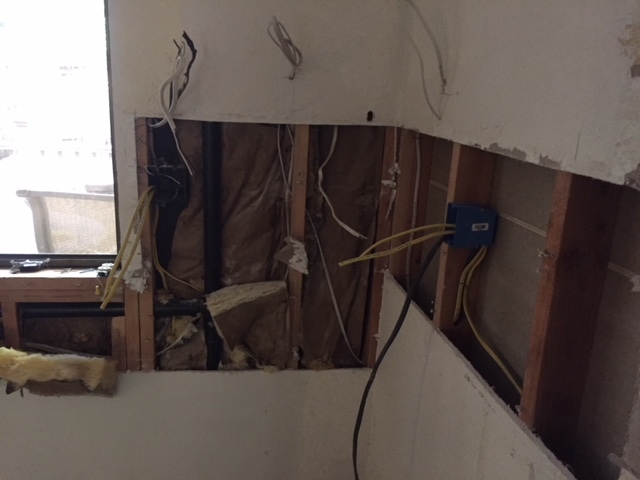 Even though we are newbies to major remodeling, I already knew that I should check out the credentials of the companies I was interested in working with and get estimates from more then one, which I did. I narrowed it down to a couple of companies close to home and checked them out on Angie's List and the Better Business Bureau and the reviews were good and I was very happy with the team we chose. After a remodel, all of a sudden the rest of the house looks kind of dowdy. Our kitchen is a sort of open plan that opens onto a family room. 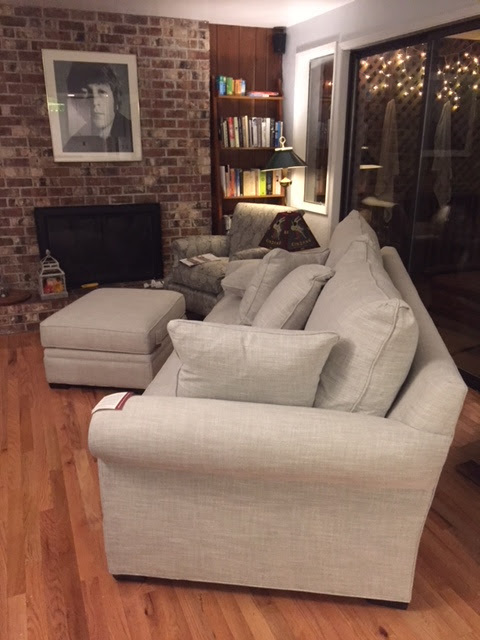 Once the kitchen was brightened up, the family room, with its leather furniture and dark walls, suddenly just didn't work, so we had to also redo the family room and, now about $3000 later, it has walls that match the kitchen and new, brighter furniture. So be prepared for that to happen. Remodeling has a domino effect. I learned I am more of a creature of habit than I thought. DURING THE REMODEL THERE WAS NO COUNTER AND NO INSTANT HOT WATER DISPENSER!!! In fact there wasn't even a kitchen, and every day there was a stranger working in there, so that was very, very difficult to get used to. I had no idea just how much time I spent in the kitchen and how much of my daily life revolved around cooking for enjoyment. 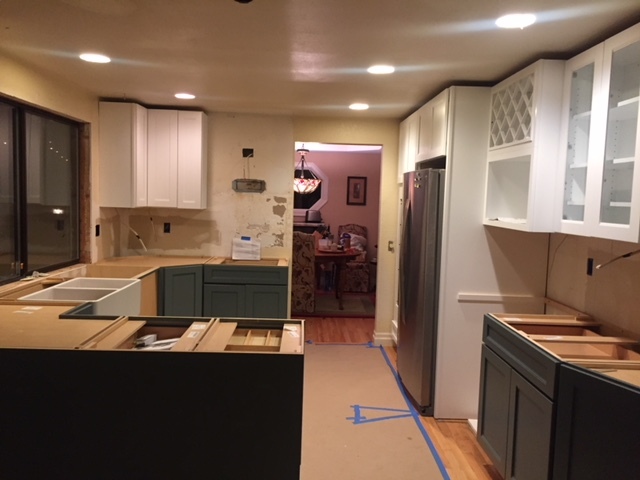 Remodeling the kitchen has to be the worst when it comes to disrupting your life unless you were remodeling a bathroom and live in a house with only one bathroom. That would be bad too. But if you have more than one bathroom, at least if you remodel a bathroom you can use the other one. 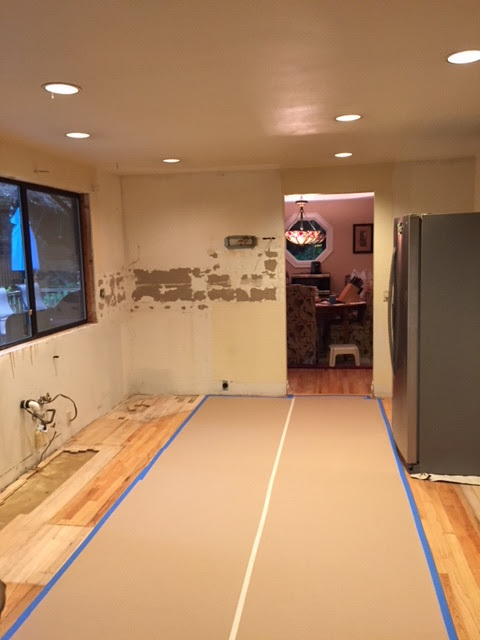 When your kitchen is torn up, you have no kitchen and no access to food or anything else in your kitchen. I learned that eating out every night is not as much fun as one would think. I consider myself a bit of a gourmand and nothing makes me happier than going into Seattle and trying a new restaurant, but going into Seattle every night was not an option so we had to eat closer to home. I never realized how few good restaurants there were near where I live. You would think it would be fun to eat out every night, but it wasn't. The cost of doing that notwithstanding, eating out every night required getting dressed and looking at least a bit presentable, which some days I just didn't want to do, likewise eating food that most days I didn't want to eat. When you eat out every night, the risk of gaining weight is monumental but believe it or not, I actually lost weight due to the stress of having to get dressed and look presentable every day and having to rotate between McDonald's, the Mongolian Grill and a sub-standard Mexican or Chinese restaurant. I would fantasize about a nice piece of fish and a salad that wasn't made with iceberg lettuce. And when I didn't want to make myself presentable, we heated up frozen dinners in the microwave. I can't believe I used to eat that stuff back in the day. Just thinking about another Healthy Choice or Lean Cuisine frozen meal makes me feel queasy. I also never realized how much of my time was spent in the kitchen cooking. Trying out new recipes on Hubby is one of my favorite past times. I also didn't realize what a food snob I have become. I also learned that in lieu of not having a kitchen, it's important to try to at least pretend life is going along as normally as possible. To do that it's important to have a sort of kitchen-like staging area where you can at least make your tea or coffee, have some toast and heat up those god-awful frozen meals (when you just can't bare to get dressed and look presentable) or have available those items you can't live without. It's a long ordeal ahead so make sure you have some comfort food available that doesn't require a kitchen to prepare. We have a dining room adjacent to the kitchen so we moved the coffeemaker and the microwave in there along with some supplies: bread, cutting board, knives, paper towels, garbage can and a huge bag of paper plates and plastic utensils along with some snacks. 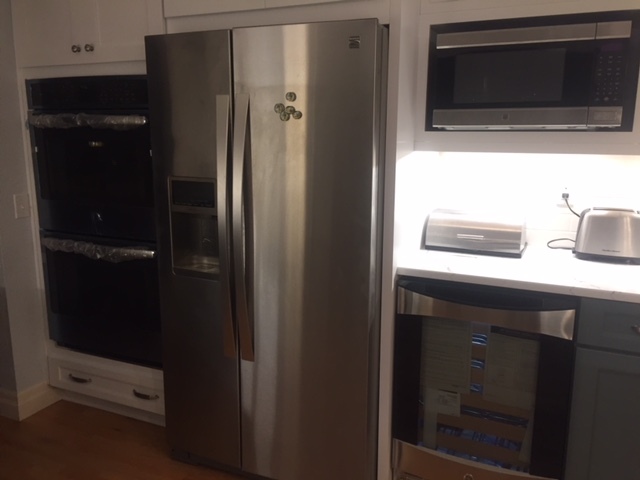 Fortunately, the refrigerator was going to remain in the same spot in the kitchen, so it was kept plugged in and the workers were able to work around it though I felt a bit embarrassed how many times I went to the refrigerator to refill my glass of wine when the workers were there. But, hey, I was stressed out! And when you are a woman of a certain age, change gets more and more difficult. As a young woman I moved across country several times and pretty much changed my life each time. Only 13 years ago we packed up and moved from California to Seattle where we knew no one. That was a big change. But as I get older, I don't like change at all. 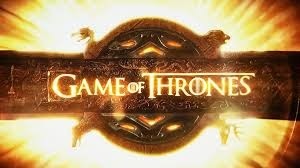 Now, I can't stand it if my daily dose of "The View" gets interrupted by breaking news or the mail doesn't come on time! So even though as remodeling goes, ours went fairly well and on schedule, I think this will be our last remodel. It's just too much change for this old broad to deal with. So, like I said, I told my kids that if I say I want to remodel another room, they have my permission to put me in a home. But until then, I love my new kitchen and I am glad we did it. 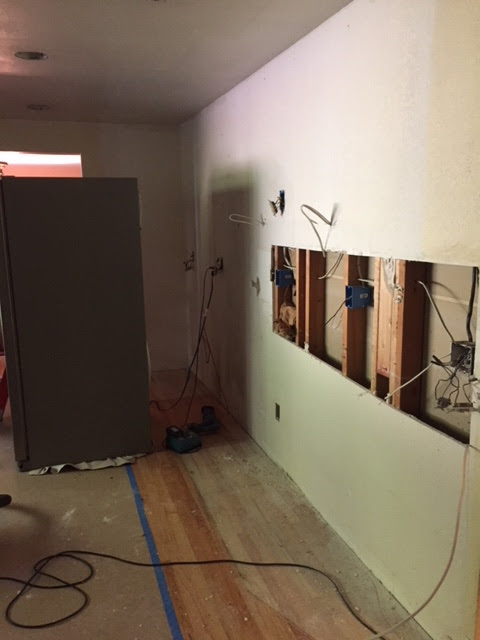 However, I confess that I am already starting to forget the inconvenience and pain of the remodel. I have a feeling that remodeling is like childbirth. After awhile, you forget the pain and think that maybe it's time to do it again. 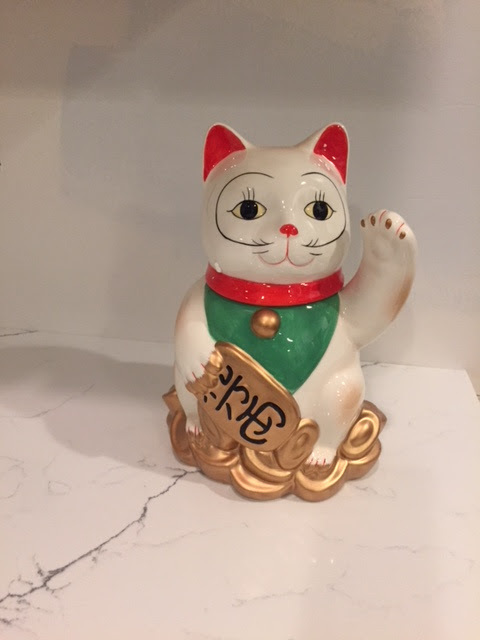 But for now, things are back to normal and my Happy Lucky Cat cookie jar and I are happy in the new kitchen!